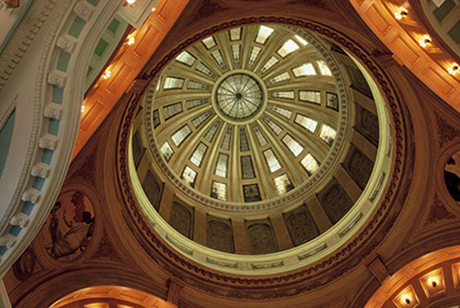 Did you know that Koch Hazard Architects worked on the restoration of the State Capitol from 1978-1991? This extensive restoration of the South Dakota State capitol complex was implemented as funds were appropriated over a 14-year period. The restoration included interior marble replacement, scagliola restoration, murals, stencils, light fixtures, floors, carpeting, woodwork, furnishings and exterior stone work. Painstaking research was required to uncover original colors and designs for all components of the Capitol Building. The interior of the building had been extensively altered in the years since its initial construction. This project won an AIA South Dakota Design Honor Award in 1992.